18 Years and Still Breathing. We begin in 2001, in a tiny 2nd floor space in Victoria Park.Karen G was the only teacher offering Ashtanga that was accessible to all(if you could make it up the stairs) . One year later, we moved literally across the street, to another 2nd floor space and were there until 2017, expanding in 2009 to the entire top floor. We moved to our current location at the HIVE in 2017. We are back to keeping it small, boutique and intimate. This allow us to give YOU lots of attention. It is what we do best. We LOVE our new space MASS District (Music and Arts South of Sunrise) in Flagler Village. Our neighbors add to our small and local vibe with cafes, retail, juice bars and craft beer and restaurant venues. Plus FREE Parking in our lot and 2 additional free parking lots on 9th street. Ground floor location. Non Heated. Doors are locked until 15 minutes before class begins so we can get our space ready for you. Get more mat time by signing up in advance on the MINDBODY app. Pay on app or when you arrive. Since 2001, we have offered daily grounded and diverse yoga classes in east Fort Lauderdale. We began as an Ashtanga studio, and soon evolved to offer many styles to more of the population. Our teachers are some of the best in South Florida. Vets and Active Military and their Families, come to our free weekly class with Connected Warrior. Thursdays 3pm. We believe in Yoga for Everyone. In addition, to our regular class drop in and package pricing, we offer some $10 Cash Happy Hour classes M-F at different times. Discounted per class rates to Active Yoga Teachers, Military, Law Enforcement, Public School Teachers-we want to thank those who serve our community and to ensure that yoga stays accessible in our changing financial situations. We are a family of skilled and unique instructors and Desk Divas, who create a welcoming, nurturing Yoga experience for all. Our weekly schedule features a variety of classes for all levels. We offer modifications and challenges in all classes, therefore we do not have “class levels”. Work as hard as you want or reel it in; The most advanced Yogis know when to chill out. “Authentic”, “Grounded”, “The Real Deal” “Friendly and Welcoming” : what some of our students say about Red Pearl. Please see our “Classes” page for descriptions of our classes. We do not heat our classes. The studio warms up fast -it’s FLORIDA! So you will get a good sweat. We do have some climate control and use it when necessary-but it won’t be cold-promise! It’s more about relieving some of that intense humidity from outside and filtering the air that you are breathing. We offer finds from artists in our community. Stock up on locally made jewelry, ceramics, aromatic oils and candles. We also sell quality yoga mats, sweat absorbing mat/hand towels and functional and stylish yogawear , t shirts and accessories by local designers. We are known for our workshops and special events: We have hosted Kino Mac Gregor, Marlysa Sullivan, Bryan Kest, Doug Swensen, Doug Keller, David Williams, Jordan Bloom, Ricky Tran, Mitchell Bleir, Tim Feldman, Joe Barnett to name a few. 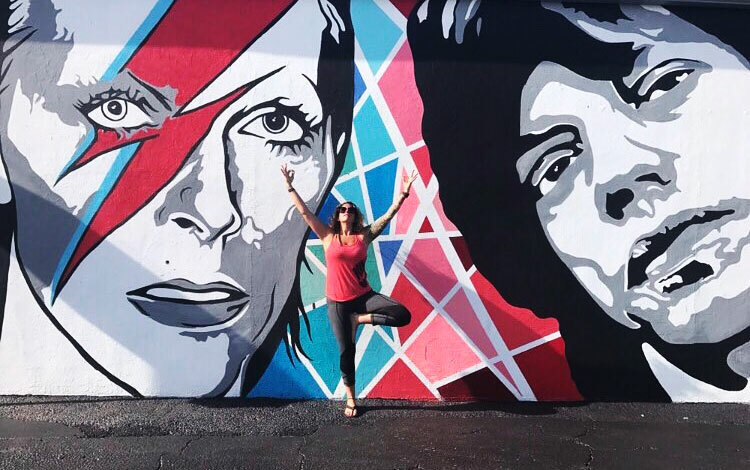 We offer special classes on health, wellness, art and more – Keto, Intermittent Fasting, Yoga Nidra, Full Moon Cacao and Reiki, Meditation… Our Teacher trainings have fostered some of the best teachers in South Florida! Come visit us starting at 6pm when you attend our monthly MASS District/Flager Village/FAT Village ART WALK. Galleries, Food trucks, Vendors, special music events, cafes, bars, restaurants and more! Let our free trolley shuttle you back and forth between the neighborhoods, or enjoy a nice walk on Mockingbird Trail with some exploration stops along the way. Our beautiful, flexible space is also available for rental for privately-organized gatherings, and workshops, Art openings and more. Professional Photographers take note of our great location with natural light and mural art galore! Please ask us for rates. Great Gallery space for artist openings! Wear breathable, flexible clothing. You want to be comfortable and able to move. Let us keep an eye on your alignment so keep it somewhat form-fitting if you are comfortable with that. Doors are locked until 15 minutes before class. We need time to get our well-enjoyed space ready for you. We accept cash and all credit cards. Please bring exact change for the $10 cash classes. Free Parking in our lot, or on Flagler Drive, or the adjacent large parking lots. As always in South Florida, keep valuables tucked out of sight in your vehicle.